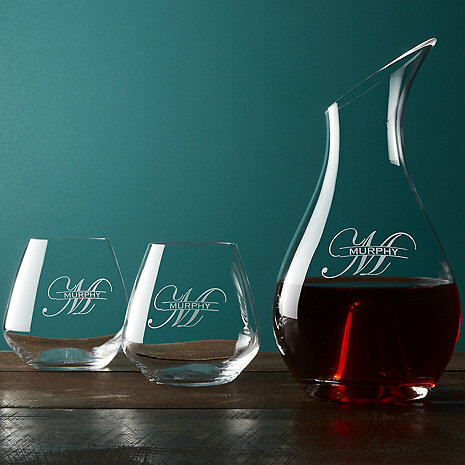 ON YOUR SPECIAL DECANTER AND 2 GLASS SET WITH INITIAL AND NAME ON BOTH CAN YOU ORDER TWO ADDITIONAL GLASSES IF SO WHAT IS THE ADDITIONAL COST? BEST ANSWER: The Personalized Wine Decanter And Tumblers Set glasses can be purchased separately. The item number is 761 30 02 and there are two glasses, the price is $39.95. This was an anniversary gift to our good friends who live in North Carolina and they love it! We loved the personalized decanter/glasses sets. The recipients of them were very pleased with their gift. Will order again for future gifting. Thanks Wine Enthusiast! ! Quick Service - Quality product - Fantastic Customer Service!!! If you are looking for a nice gift or something personalized for yourself look no further. The decanter is easy to handle and to pour wine. It also sparkles with the engraved name. This was a Christmas gift and the recipients LOVED it!!!! Would definitely recommend. Itâ? ?s beautiful! This was gift and they like them very much Would reconm them. The products are very well made and the engraving is beautiful. I would have given a four star rating but the delivery took so long it missed my husbandâ? ?s birthday and arrived closer to Christmas. We gave this as a wedding gift and they were very pleased with the quality and style. We gave this decanter and glass combination as a gift to friends. They said that they are enjoying it very much, but wish we would have sent something to put inside it. I asked for someone to credit the shipping charge it didnt arrive before Christmas as promised! I really liked how the product turned out. My only disappointment was in the shipping. I had placed my order on Dec 8th, for a Christmas gift, and payed the two day shipping option. At that time there was notice guaranteeing that you would receive your order by Christmas. Unfortunately I only received half my gift (the decanter) by then, the tumblers arrived after the 25th. Therefore what was to be a Christmas gift, turned into a New Year's gift. But once it arrived, I found that it did look just like picture. Ordered for xmas on Dec4 and didn't deliver glasses until first week of Jan.